During my visit to Mercedes AMG before Christmas, the company set us a challenge that’s been put to other more notable visitors. In the engine build area, two engines were arranged in each bay, but without the coil pack, heat shield and exhausts fitted. Our task was to fit these parts to one side of the engine, along with tightening each fastener to the correct torque setting. A dozen journalists attended the day, the challenge being made even greater as the two current Mercedes AMG drivers had also previously completed the challenge. The first job was to fit the coil pack. 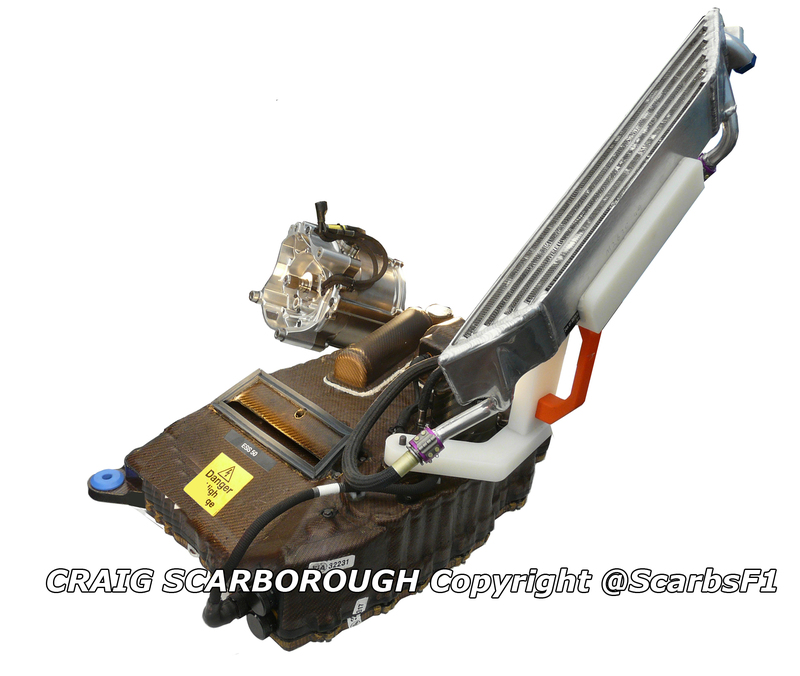 The four-pronged carbonfibre cased unit is a press fit atop each spark plug, then the we needed to connect CAN electronics interface near the front of the airbox. 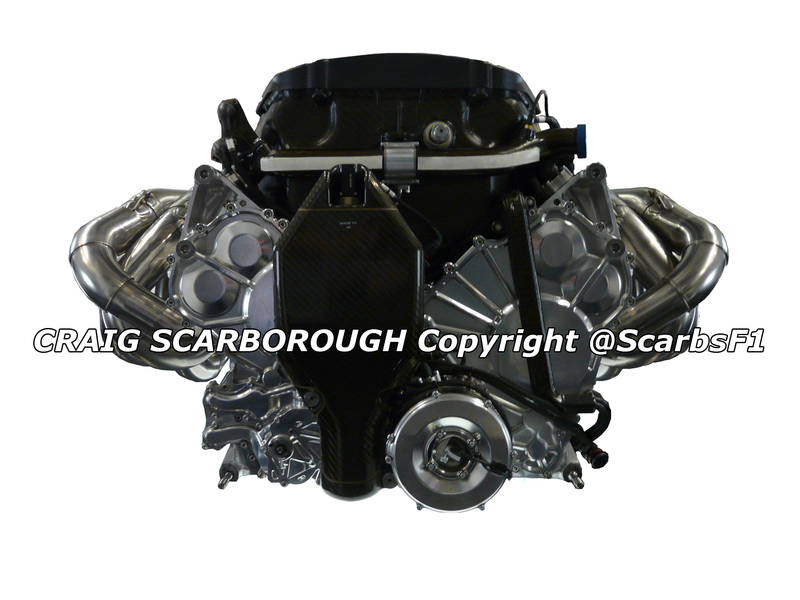 A small reflective coated carbonfibre heatshield goes over the coil pack, attached with three small bolts, one of which is smaller and requires a different torque setting. Then onto the exhaust system, weighing about 3kg each exhaust is hand made from thin sections of inconnel welded together. Although the 4-into-1 exhaust is one assembly, there is some play in the primary pipes joints with the collector, so fitting the four exhaust pipes to the studs on the engine requires a little fiddling. Each exhaust pipe bolts to the exhaust port with three nuts, two above and to the side of the exhaust pipe, and one centrally below. Each of these 24 nuts being tightened to the same torque setting. With the engine up on the stand and being able to kneel below the engine, getting access to each fastener was surprisingly easy, none of the exhaust pipes being particularly obstructive. I’m sure doing the same job with the engine in the car and the floor fitted is a very different story. A quick check that each nut is torqued correctly and the job's done. I completed the challenge in 4m 30s and I was satisfied I’d done a good job. However ex Racecar Engineering magazine editor, Charles Armstrong Wilson completed the challenge in an impressive 3m 30s! Even though one (un-named) journalist took as long a 7m 57s, as group us journalists were confident we’d done a good job. But the teams Drivers had soundly beaten us all. Nico Rosberg did the challenge in 3m 15s, while Michael Schumacher did it thee minutes dead! The job of the F1 engine builder and mechanic is a difficult and skilled one, the skills of the F1 driver are ever impressive and I’ll stick to drawing racecars and not working on them! One of Max Mosley’s lasting legacies in F1 was the introduction of his vision of a green initiative in F1. As a result KERS (Kinetic Energy Recovery System) was introduced 2009, as part of a greater package of rule changes to change the face of F1. KERS is a system which harvests energy under braking and stores it to provide the driver with an extra power boost each lap. A simple technical summary of KERS is here (https://scarbsf1.wordpress.com/2010/10/20/kers-anatomy/ ). During the 2009 season McLaren were applauded for running Mercedes KERS at every race and it was widely reported as the best KERS in use that year. 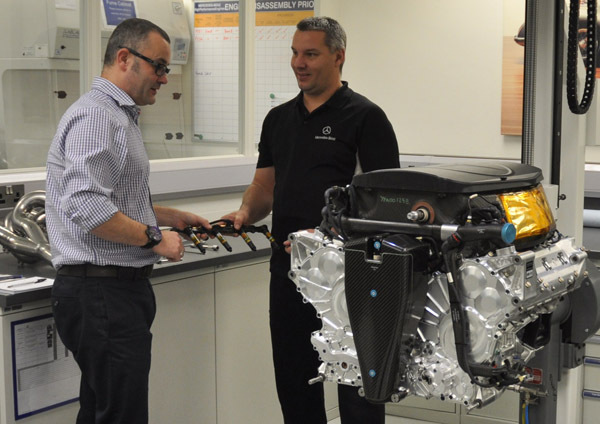 Along with a few other journalists, I was invited along to Mercedes AMG Powertrains in Brixworth, UK to hear about KERS development since 2009. With Managing Director Thomas Fuhr and Engineering Director Andy Cowell giving a presentation on the range of work Mercedes AMG does with its F1 teams. Mercedes AMG Powertrains reside on the site that was previously Mercedes Benz High Performance Engines (MBHPE). Now renamed to reflect the wider application of the groups knowledge, both to uses outside F1 and to areas other than engines. Powertrain is a catch all term covering; engine, transmission, electronics and of course KERS Hybrid systems. 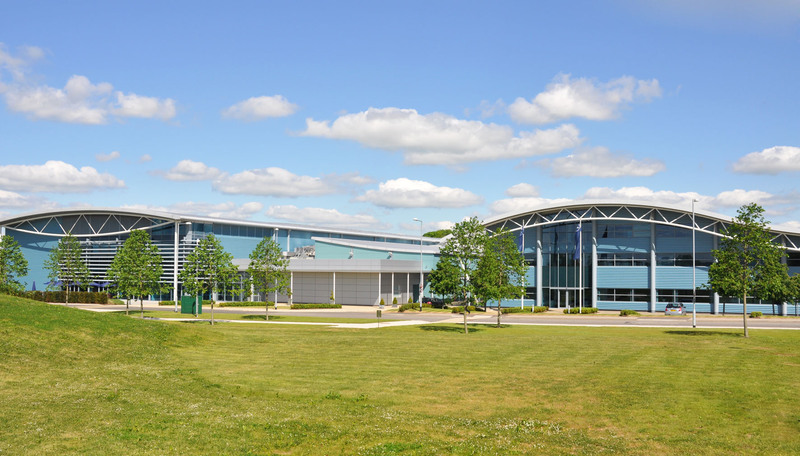 The company have built a purpose designed Technology Centre on the site, which historically was the Ilmor engine plant and positioned just a few miles from Cosworth in Northampton. Clearly this area has a rich seam of Engine knowledge. 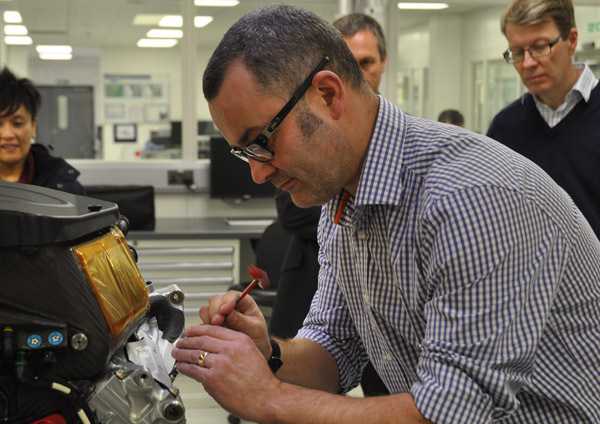 Formed around three buildings the entire F1 engine and KERS development is carried out on site, only specialist functions such as the casting of the crankcases is carried out off site. Additionally other Mercedes AMG work is carried out here, such as the AMG E-cell car. Mercedes AMG (MBHPE as it was known then) developed their first KERS for 2009 in house. At the time McLaren were the primary customer for the system, although Force India and at the last minute Brawn GP were also customer teams that year. 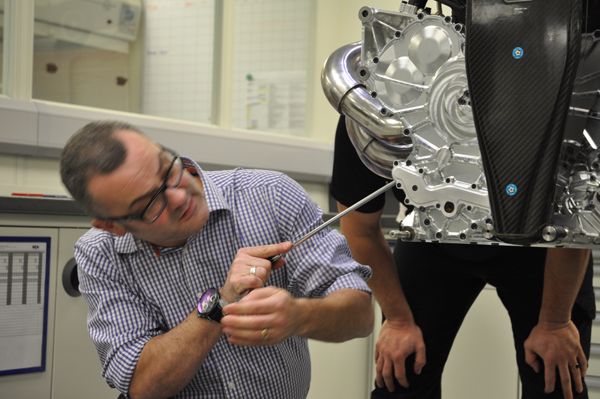 Force India had a chassis prepared to run KERS, but chose not to during the season. Brawn had a chassis designed before their switch to Mercedes engines, so their car was not designed to accept the Mercedes KERS. 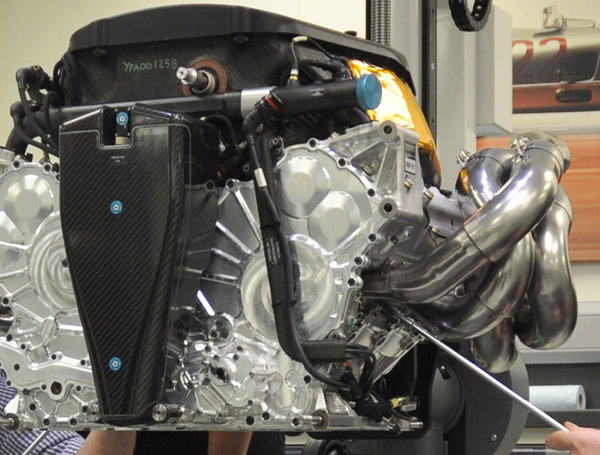 In designing the system, Mercedes AMG had a specific requirement from McLaren. As the effectiveness of KERS was unknown, McLaren didn’t want to compromise the car if KERS was removed. So the system was packaged to fit into a largely conventional car. Whereas other KERS suppliers went for a battery position under the fuel tank, McLaren and Mercedes AMG placed theirs in the right hand sidepod. Low down and far forward, on the floor between the radiator and the side impact structures. The battery pack contains not only the array of individual cells, but also the pump and pipe work for its water cooling circuit. As well as the electronic interfaces for its control and monitoring. The assembly is around 7cm high, 12cm wide and 40cm long. The KBP is probably the single heaviest KERS component. In 2009 this sidepod package was acceptable as the teams were still on Bridgestone tyres and seeking an extremely forward weight distribution. 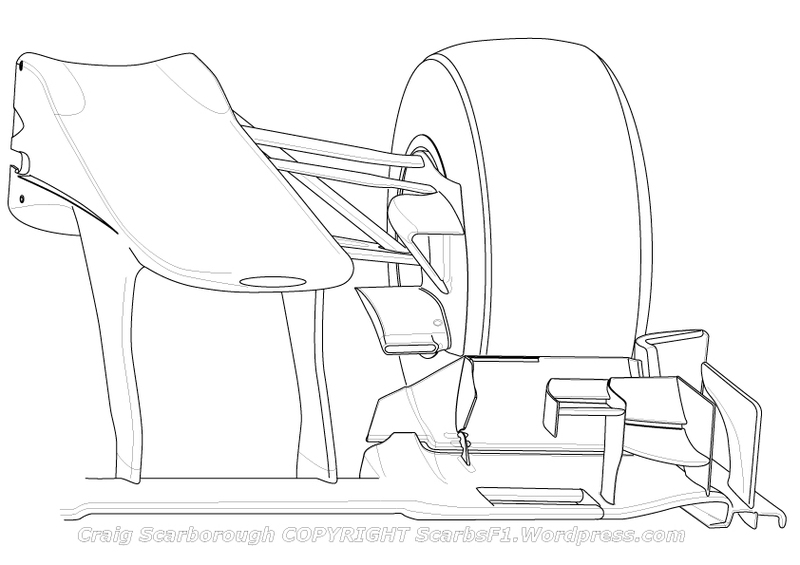 Thus the 5cm higher mounting in the sidepod was offset by its forward placement. Conversely the smaller Power Control Unit (PCU) was placed in a similar location in the other sidepod, ironically the PCU is around the size and shape of road car battery. This left the monocoque uncompromised, aside from the smaller cut out for the MGU in the rear bulkhead. Then the Motor Generator Unit (MGU) is mounted to the front of the engine. This device generates and creates the power for the KERS. Its driven from a small set of gears mounted to the front of the crankshaft. the unit remains with the engien when the car is dismantled and is oil cooled along with the engine. All of the components are linked both to the SECUs CAN bus and to each other by High Current Cable. The latter taking the DC current between the Batteries and MGU. With this packaging Mercedes AMG quotes the total system weight as 27kg. Designed and developed by Mercedes AMG, but other partners were involved; the unique battery cells were supplied via A123 and the MGU was partnered with Zytek. Although the power control electronics were solely a Mercedes AMG in house development. Through the 2009 season both McLaren drivers had a safe and reliable KERS at each race. The system was safe even after crashes and was fault free despite rain soaked races. Safety was designed in from the outset, all electrics were double insulated. Teams can also measure damage to the unit via accelerometers and insulation sensors, so any impact or incidental damage can be monitored and the car retired if the need arises. Additionally each cell in the battery has its temperature monitored. KERS batteries are sensitive to high and low temperatures, each cell needing to operate in a specific thermal window. Too low and the unit is inefficient and too hot and there’s the danger of explosion. Perhaps the only criticism was the sidepod battery mounting, despite several incidents, this never put any one in danger, so this never proved to be an unsafe installation. For a variety of non technical reasons KERS was agreed not to be raced from 2010 until the planned 2013 rules. However this plan changed, but not before Mercedes AMG had made new strategic plans around KERS. Mercedes AMG set out a longer term strategy to work on research for KERS in preparation for 2013, as well as working with AMG to develop the road car based E-cell technology. 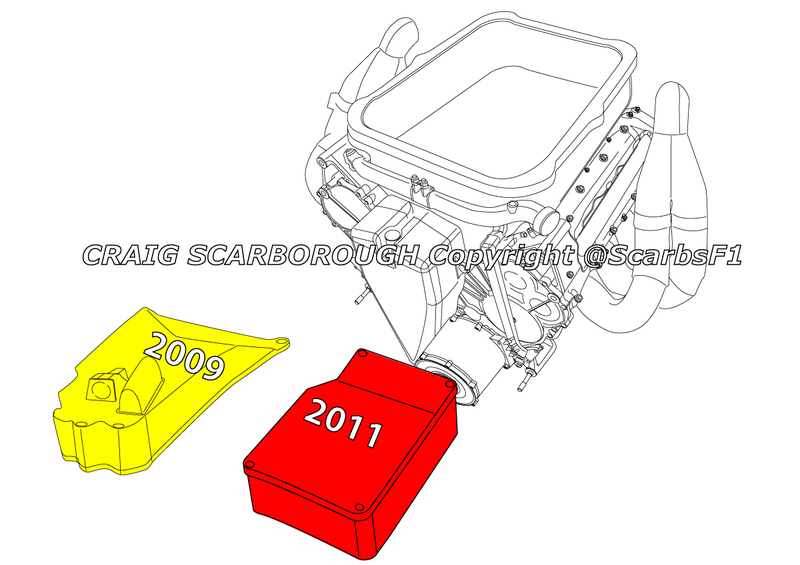 This changed when the plans for the 2013 engine were pushed back to 2014 and KERS was agreed to be reintroduced for 2011. Thus the 2013 development plans had to rebased and deliver a refined version of the 2009 KERS for 2011. Moreover there were now three teams to be supplied with KERS. There was no Christmas for Mercedes AMG staff 2010! As a result of the research work carried out after 2009, Mercedes AMG now solely design, develop and produce the entire KERS package, aside from the Battery cells. So now the MGU is a wholly Mercedes AMG part. With KERS effectiveness proven in 2009, it was possible to have the cars designed around it, rather than it be an optional fitment. So the packaging was revised and the entire system integrated into just two units. 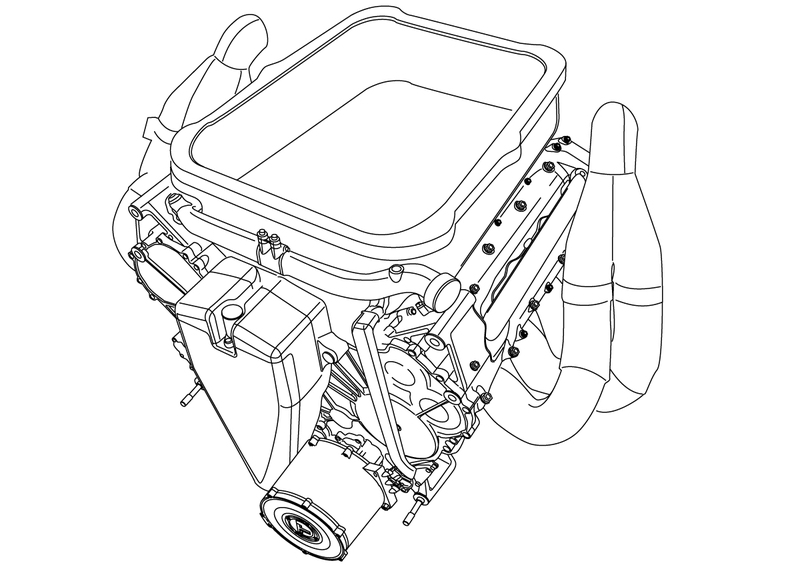 The MGU remains attached to the front of the engine, still driven off a spur gear on the nose of the crankshaft. While the KBP and PCU are now integrated into a much smaller single package and fitted under the fuel tank. The unit bolts up inside a moulded recess under the monocoque, the unit being attached using four vibration mounts, and then a closing panel and the cars floor\plank are fitted under it. 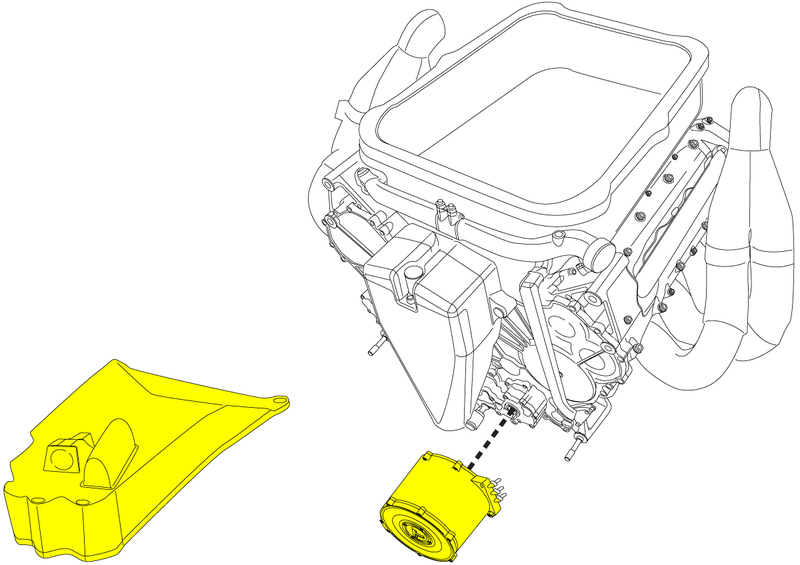 The 2009 battery pack (yellow) is now integrated with the power electronics (not shown) in a single unit under the fuel tank (red). It’s this integration of the batteries and power electronics that has has really slimmed the 2011 system down. Mercedes AMG now quote 24kg the entire KERS, much of the 3kg weight loss being down to the reduction in the heavy power cabling between these units. Not only is the packaging better, but the systems life and efficiency is too. Round trip efficiency stands at a stated 80%, which is the amount of power reapplied to the engine via the MGU after it has been harvested and stored. Improvements in efficiency being in both the charge and discharge phases. Battery pack life was extended to as much as 10,000km, several times the 2009 predictions that batteries would need replacing every two races (2,400km). Over this period, the cells do not tend to degrade, as the team manage the unit’s condition (‘State of Charge’ & temperature) throughout the GP weekend to maintain their operational efficiency. The 80hp boost KERS provides, stresses the engine. 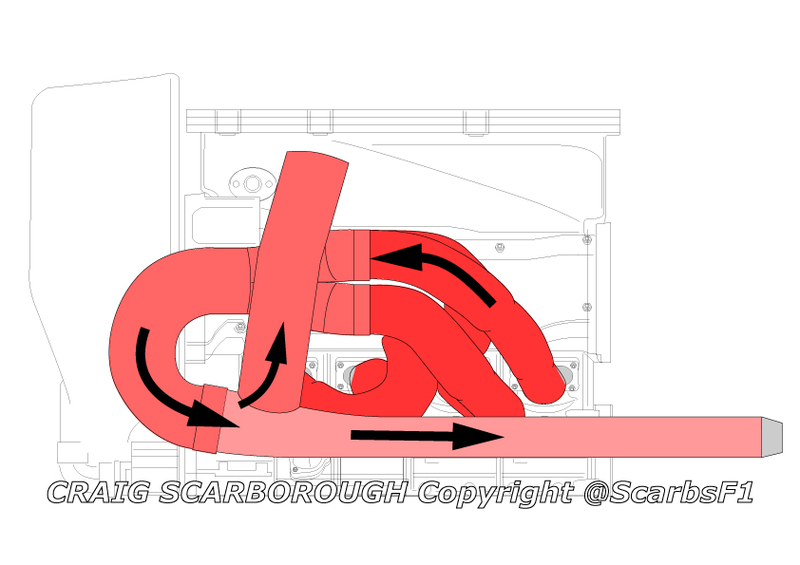 This was well known back in 2009, but for 2011 along with DRS the car can be several hundred revs higher than the usual EOS (end of straight) revs. Mercedes AMG quoted 15-25% more stress for a KERS and DRS aided lap, this needing to be taken into account when the team monitor the engines duty cycle, thus deciding when to replace it. Mercedes conducted additional dyno development of the engine being kept on the rev limiter to fully understand and counter this problem. This work paid benefits; Hamilton ran many laps at Monza bouncing off the rev limiter along the main straight, while chasing Vettel. Although the max 60KW (~80hp) output can be reduced from the steering wheel, its normal for the driver to use the full 80hp boost each time they engage the KERS boost. With a reliable KERS, the driver will use the full 6s boost on every lap. Media reports suggest Red Bulls iteration of the Renault KERS does not use this full 60kw. Instead something like 44kw, providing less of a boost, but allowing smaller batteries to be used. The loss in boost being offset by the overall benefit in car packaging. The driver engages a KERS boost either via a paddle or button on the steering wheel, or by the throttle pedal. The latter idea being a 2009 BMW Sauber development, where the driver pushes the pedal beyond its usual maximum travel to engage KERS. Nick Heidfeld brought this idea to Renault in 2011 and the over-extended pedal idea has also been used for DRS too. Once the driver is no longer traction limited out of a turn, they can engage KERS. Usually a few small 1-2s boosts out of critical turns provides the ideal lap time. It’s the driver who has to control the duration of the boost, by whichever control. As with gear shift the drivers can be uncannily accurate in their apportioning of the boost around the lap. 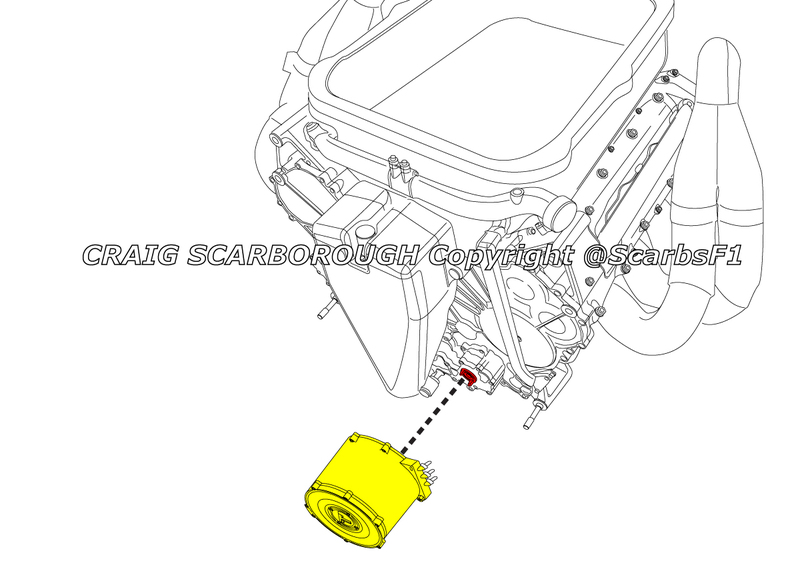 It’s suggested that the 2009 Ferrari system apportioned the duration of the KERS boost via a GPS map, the driver simply presses the button and the electronics gives them the predetermined amount of boost. This solution came as surprise to Andy Cowell, so one wonders if this is legal or perhaps if the report is true. From on board shots, we’ve seen the steering wheel has an array of LEDs or numerical displays to show the driver the boost remaining for that lap. The SECU will have control code written to prevent overuse of KERS around a lap. Typically the battery will hold more charge than a laps worth of harvesting\discharge. So that any unexpected incidents do not leave the driver without their 6s of boost. In use KERS can be used in several different ways. When lapping alone KERS typically gains 0.45s per lap, although this varies slightly by track. Along with DRS is can boost top speed by 12kmh. As explained the driver uses a pre-agreed amount of boost, decided from simulation work done at the factory before the race. So the planned strategy of KERS usage will be used in practice, qualifying and in parts of the race. 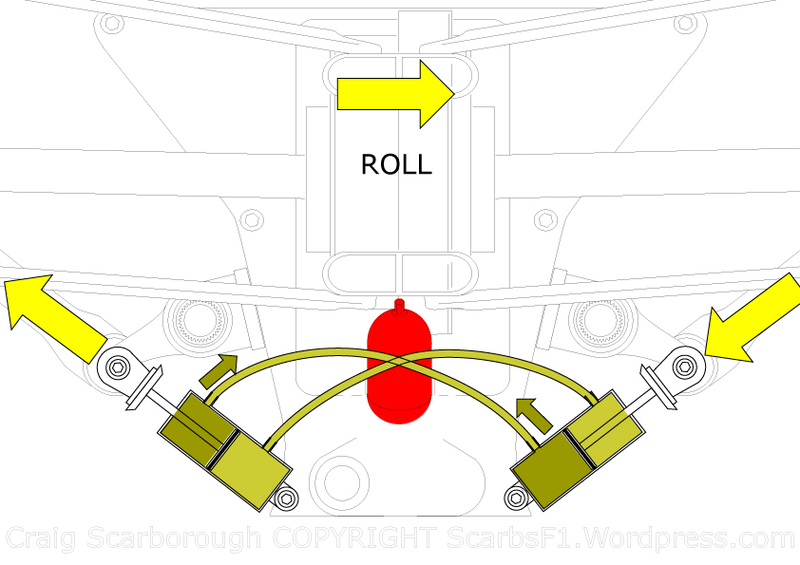 However in the race the driver can use KERS tactically to gain an advantage. Drivers are able to use more a KERS boost to either overtake or defend a position. One feature of 2011 along with the Pirelli tyres being in different condition during the race, was the driver’s freedom to alter their racing line and use their grip and KERS to tackle their rivals. KERS continues in its current guise for another two years, then for 2014 along with all new engine regulations there will be a new format KERS. Energy recovery will be from different sources, so the overriding term for the hybrid technology on the car will simply be ERS (Energy Recovery Systems). However KERS will still exist, harvesting energy from braking, but will have a greater allowance for energy stored and reapplied. But, there will also be TERS (Thermal Energy Recovery), which a MGU harvesting energy from the turbocharger. 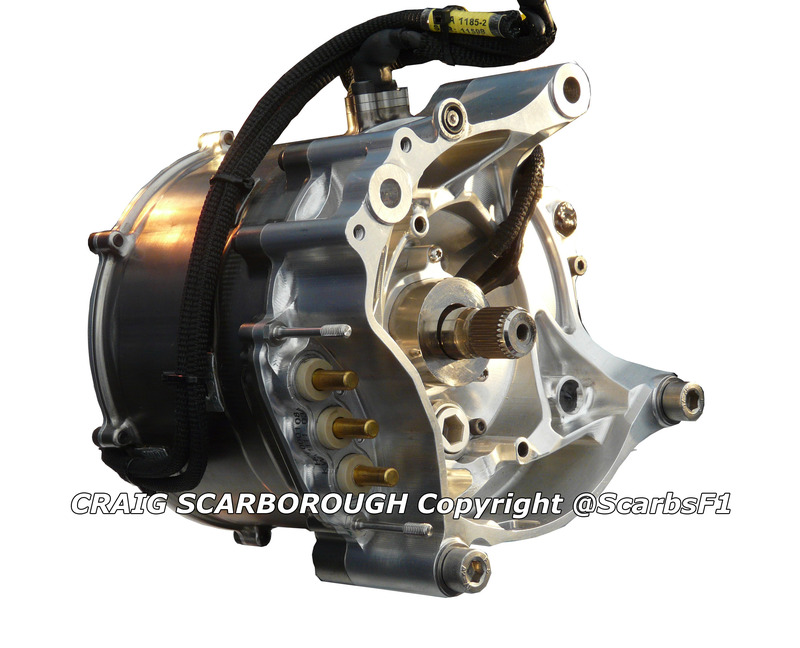 Overall ERS will provide a third of the engines power for some 30s of the lap. No longer will the driver press a button for their KERS boost, it will be integrated in their demand for power from the throttle pedal. The electronics will be constantly managing the Powertrains energy, harvesting and applying energy based on whether the driver is on or off the throttle. 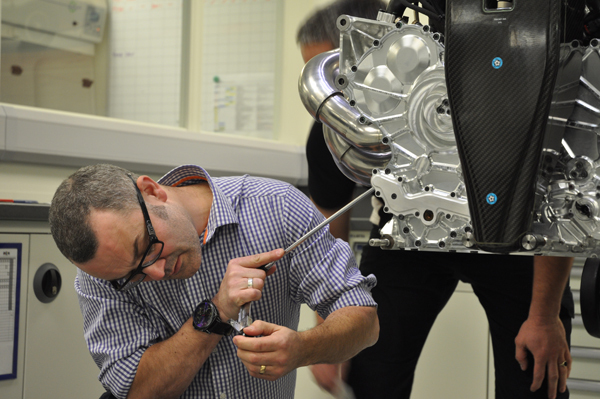 In 2014 Powertrains and ERS is set to become very complicated. After a slow start to the 2011 campaign Mercedes GP brought along the long expected changes to the W02 at the last Barcelona test. 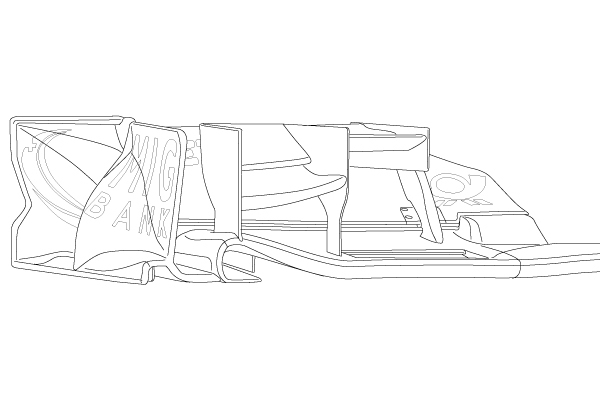 We have already covered the front wing (https://scarbsf1.wordpress.com/2011/03/11/mercedes-w02-new-front-wing-analysis/). 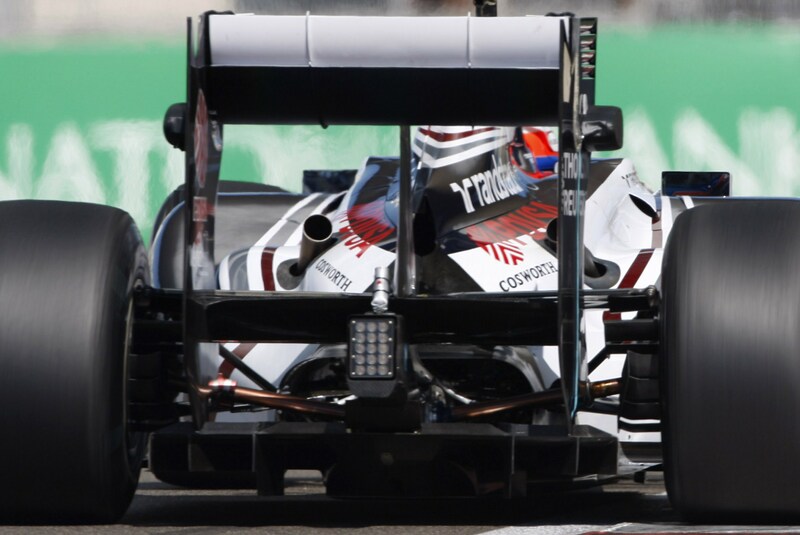 But more crucially was the revised sidepod and exhaust package. Mercedes have gone their own way with the design of the W02, with its short wheelbase set up and the resultingly bulbous mid section. Contrary to my expectations the new sidepod\exhaust package was not as unconventional as expected. Which still leaves some questions over some design choices on the car or the permanence of the solution shown in Barcelona. Firstly the new sidepods are formed of a completely new moulding, common to several other teams the sidepod bodywork is one piece and is not formed by add-on sections to the monocoque. Even though the general shape appears the same as the launch format, the overhead view shows the sidepod inlets are angled inboard slightly. Although the bigger visual change is the exhaust and cooling arrangement. Uniquely the exhausts are sited halfway along the sidepods, exiting where the sidepod is nearly at its widest and starts to taper in to the coke bottle shape. 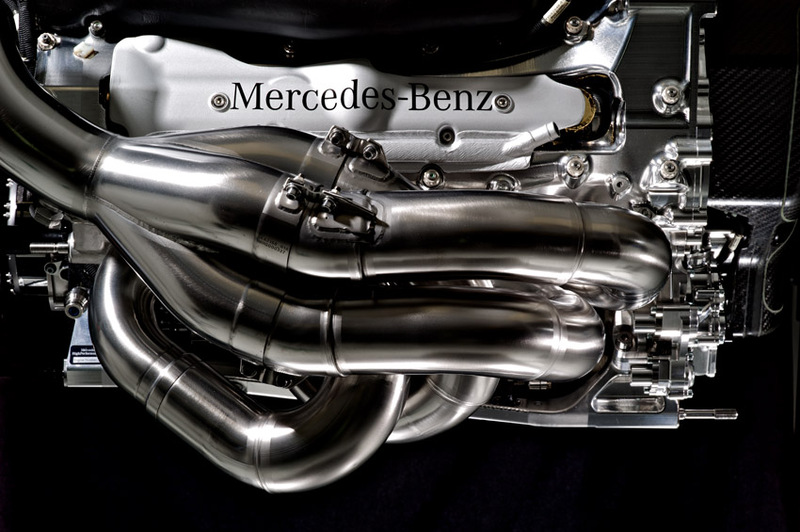 Unlike Red Bull and Ferrari Mercedes have not extended the exhaust towards the diffuser, instead the exhaust blows over a long length of open floor. 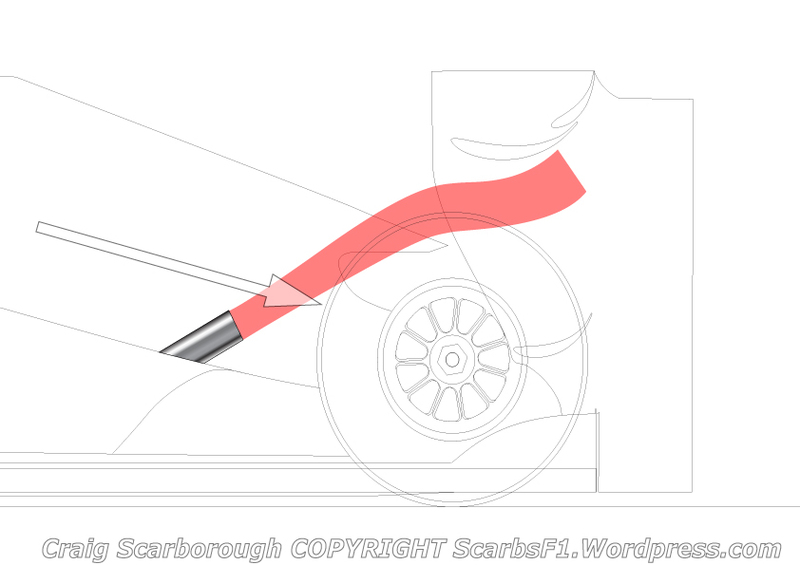 A small vane redirects the flow inboard of the rear wheels and into a coved section that sends the exhaust flow under the diffuser to be more effective at creating downforce. To keep the bodywork safe from its close proximity the exhaust pipes numerous grilles are moulded into the sidepod. The rearmost of these are outside the exclusion zone for cooling outlets, but the larger removable grille appears to be at odds with the bodywork rules. 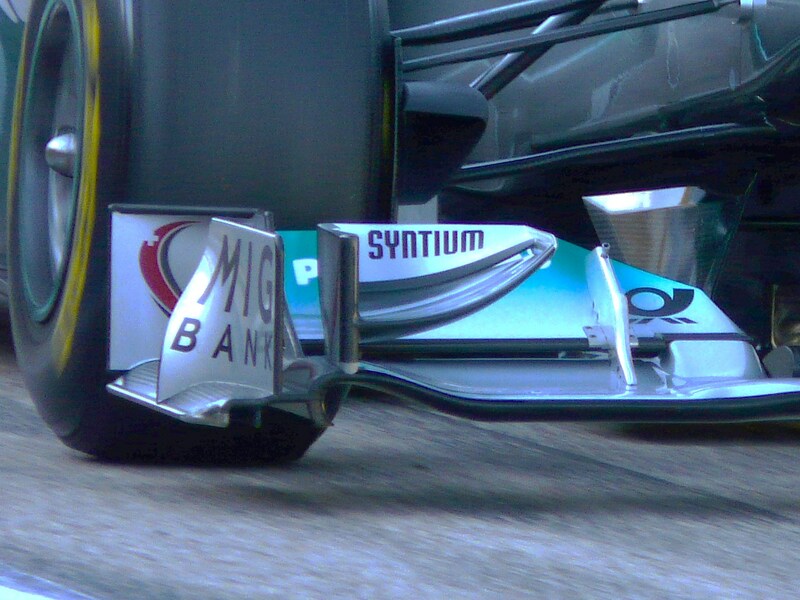 Perhaps the low exhaust position (below the 100mm above the reference plane) allows the grille to be regarded as the opening for the exhaust. Equally these could have been precautionary fitments for overheating (which blighted the cars earlier tests) and might removed for the Australian race. 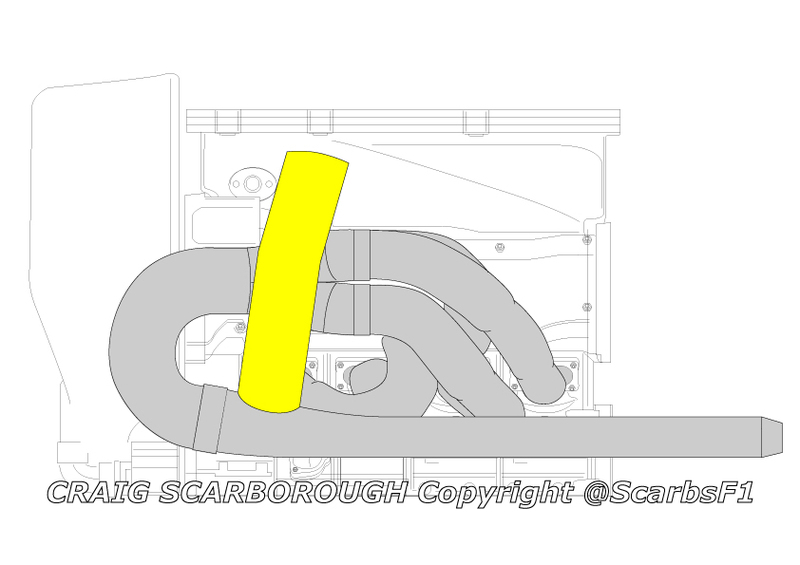 Having the exhaust so far forward does not make the exhaust act like Renaults Front-Exit-Exhaust, nor like Red Bulls ducted set up. 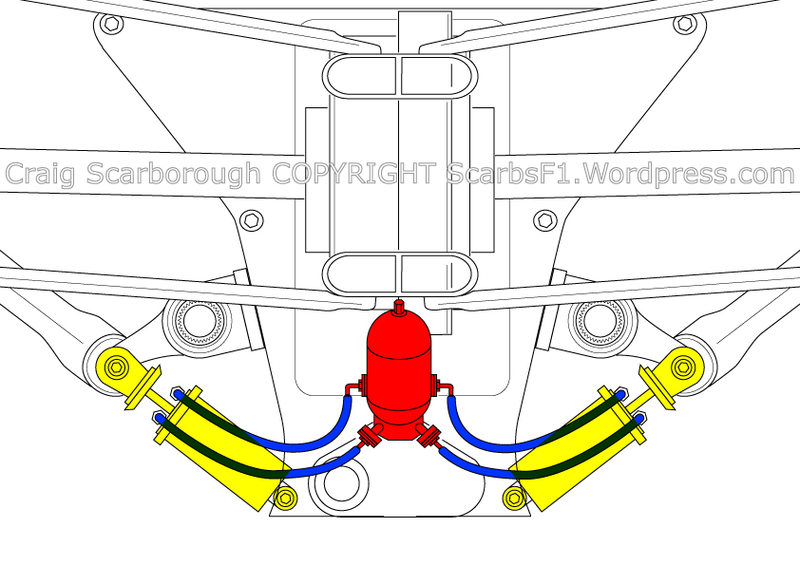 The exhaust gas will lose energy as its merges with the freestream airflow before it reaches the diffuser. 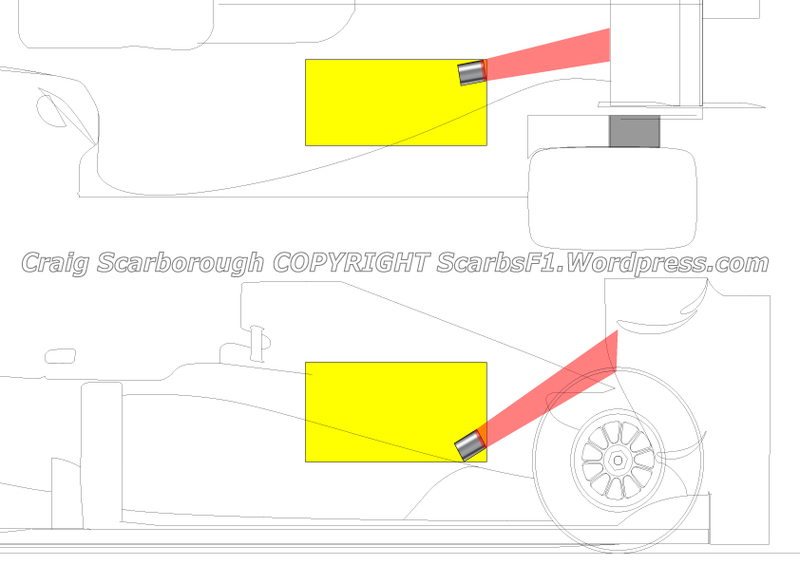 Its exactly this energy that teams want to exploit to drive more flow through the diffuser for more downforce. So why is the set up a less efficient solution? Potentially there are several reasons, last year Mercedes struggled with overheating bodywork, unable to get enough supply of the permitted Glass Ceramic Composite (GCC) material used to protect the phenolic composite of the cars floor and bodywork. When they ran their blown floor, the heat, simply melted and warped the bodywork. Its unlikely supply of the material is still an issue, but keeping the bodywork cool and the nature of the exhausts might be the problem. All three Mercedes teams (McLaren, Mercedes GP and Force India) all had issues with sensitivity of the car when run with EBDs in 2010. McLaren found the cars balance changed significantly on and off throttle, while Mercedes found that the exhaust plume would touch differing parts of the bodywork in different sessions and even differed between cars. This suggests that the exhaust plume was less than predictable. Where-as CFD and wind tunnel tests use a simulation of the exhaust blowing, perhaps the knowledge of what the exhaust flow is actually like is missing. Strangely this seems to be a very Mercedes engine specific problem. Being too aggressive with the exhaust blowing and too specific with the heat shielding makes the car throttle-sensitive and prone to overheating bodywork. McLaren have more problems with their EBDs in pre-season testing and Force India have yet to truly shine, with an otherwise good looking design. 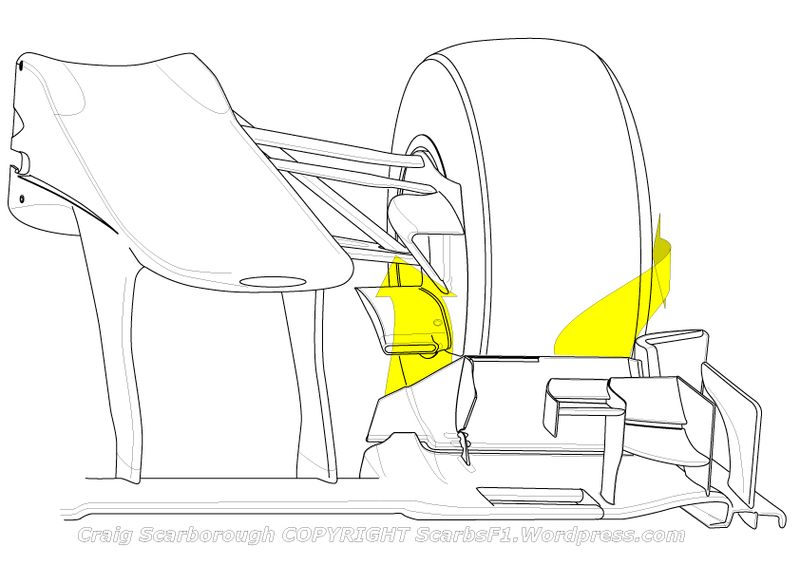 If this is the case, then the teams either have to lose potential downforce by having to use a less aggressive EBD solution or suffer the sensitivity problem. Its hard to be clear how easy an unpredictable exhaust plume might be to solve, its not likely to be a solution teams and engine suppliers have had to look at before. 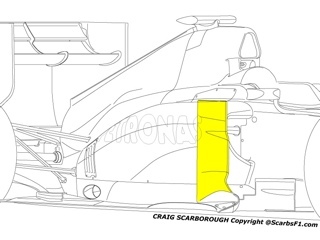 Elsewhere on the sidepods the cars pod vanes have been enlarged from the truncated versions seen in the cars early tests. Why the team would be run stunted versions of long standing designs is again part of the confusion around the W02 debut. The pod vane features an unusual outwards bulged lower section. This mimics the shape of the short launch spec vane. 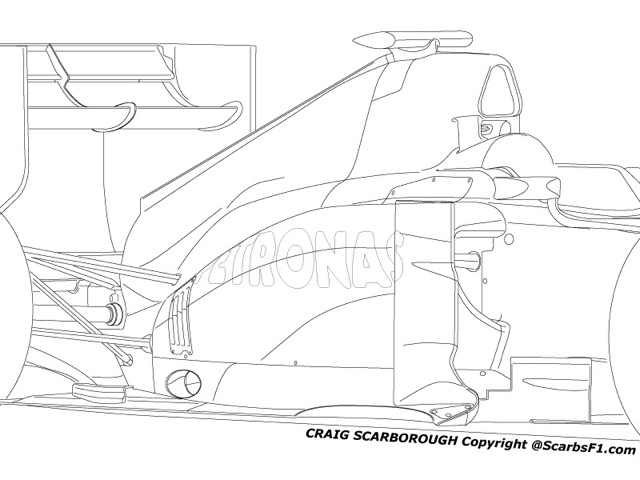 I presume this is mated to the sidepods undercut to feed more flow around the sidepod and over the diffuser. 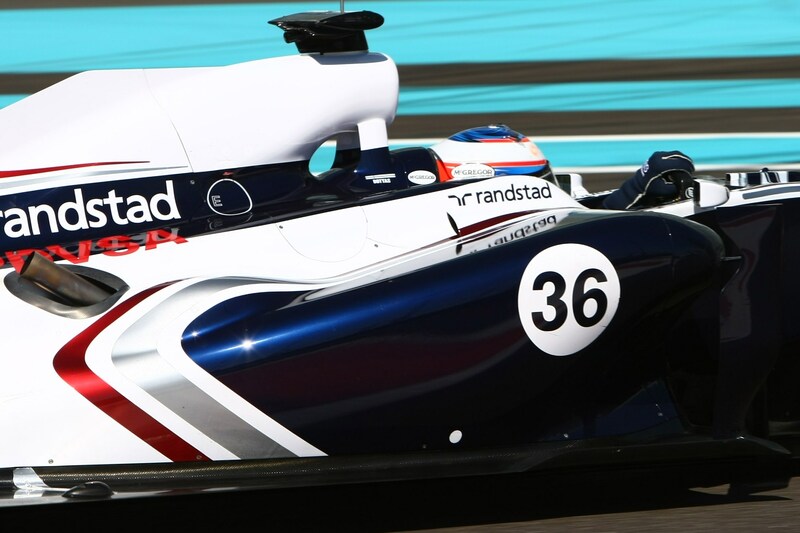 Along with the new undercut the car sports new serrated bargeboards and the complex shaped under nose vanes from late last year have been revised with the more common nose cone mounted vanes. 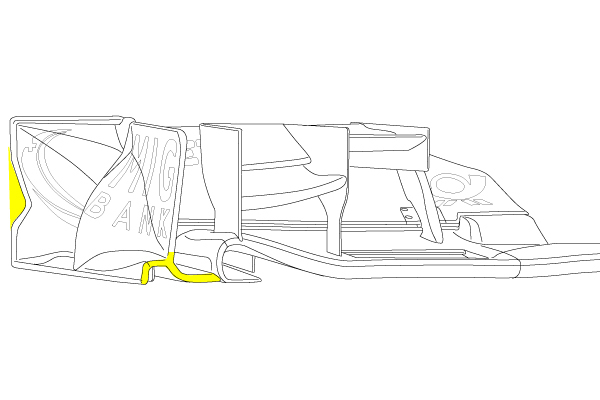 One last unsolved conundrum is the side impact protection on the sidepods. 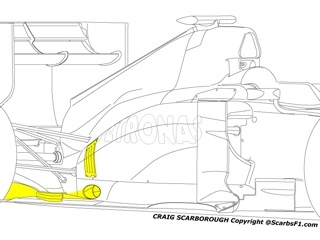 Normally teams pass the side impact tests with two pairs of crash beams, one upper pair above the sidepod inlet and a lower pair in line with the floor. Each of these pairs are formed of one larger carbon beam and a smaller one to spread the load over a wider area of the chassis. Rules demand these parts are not exposed to the exterior airflow and must be covered by bodywork. These structures are quite heavy and unavoidably raise the cars Centre of Gravity (CofG). This years car sports something appearing very much like a side impact structure passing horizontally across the middle of the sidepod inlet. 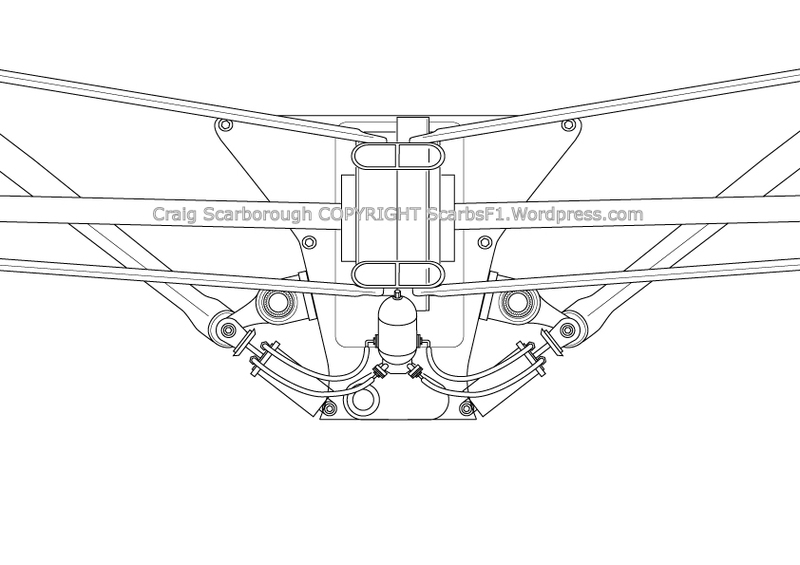 This would be beneficial as the weight is that much lower down and better for a low CofG, a high CofG was a problem that afflicted the 2010 W02. Meanwhile at floor level the structure is unusually slim, which is better for aerodynamics. But this mid placed structure appears to be in contravention of the rules as its exposed to the airflow. The FIA have started to be stricter with teams interpretation of these structures, so its hard to understand why this set up has been accepted. Possibly the structure is covered by vestigial bodywork to bypass the rules, but this detail did again promote some of my ideas that the sidepods were to be more unconventional. If allowed this year, we can expect the FIA to stamp out this set up for future years. Of course teams cannot copy this, as crash structures are homologated for the year, and cannot be changed. After three tests Mercedes produced their updated front wing at Barcelona today. Elements of this wing have been seen on the Launch specification wing, such as the extra slot made in the main plane. The wing (main plain and flap) itself is largely similar to the launch spec wing, while the endplate and cascades have been changed. Mercedes front wing design harks back to the Brawn BGP001 of 2009. 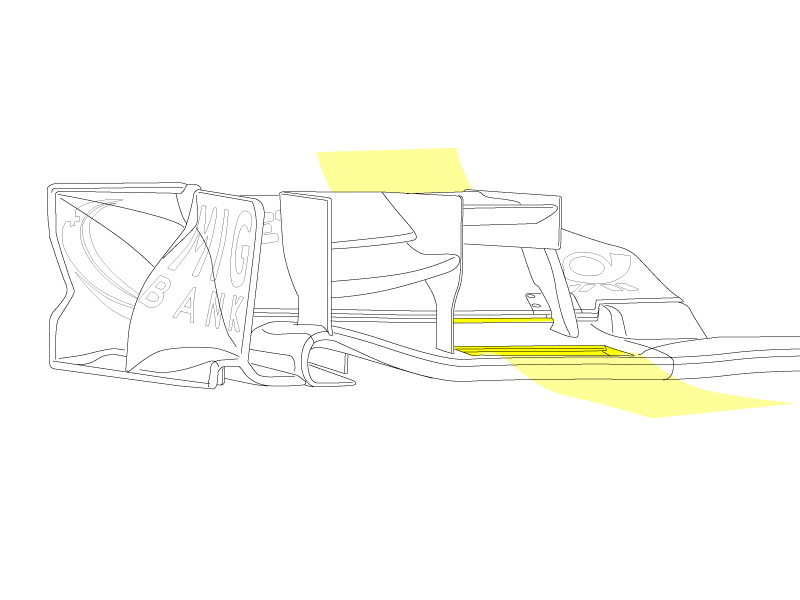 The BGP001 pioneered the idea of the endplate-less wing. With the wider wings for that season sitting as far out as the width of the tyres, the contemporary endplates before that time, no longer worked to direct flow inside the front wheel. Brawns aerodynamicists reshaped the wing to best redirect flow around the front wheel and effectively removed the vertical endplate and replaced it with vanes. 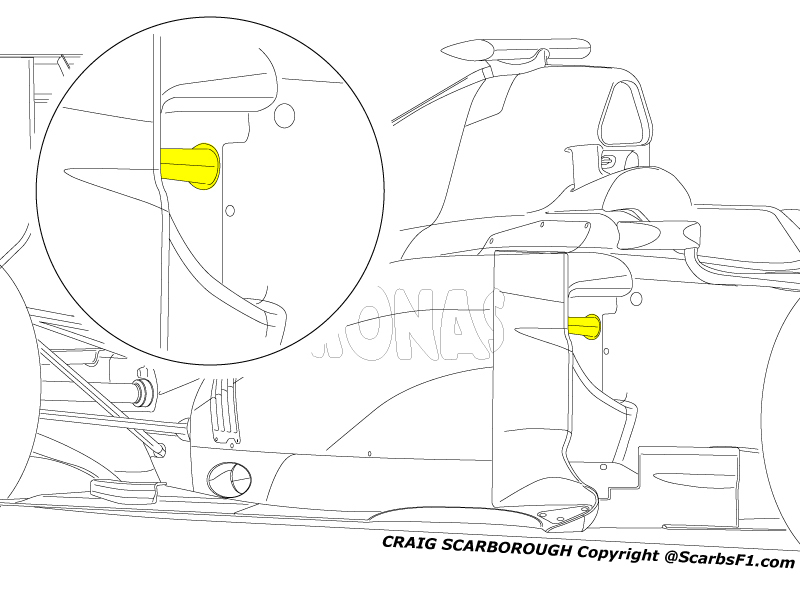 These vanes are there to both redirect airflow and to meet the minimum bodywork rules. To aid downforce in the area inboard of the front tyres, Brawns designers added a free standing winglet, known as a cascade. 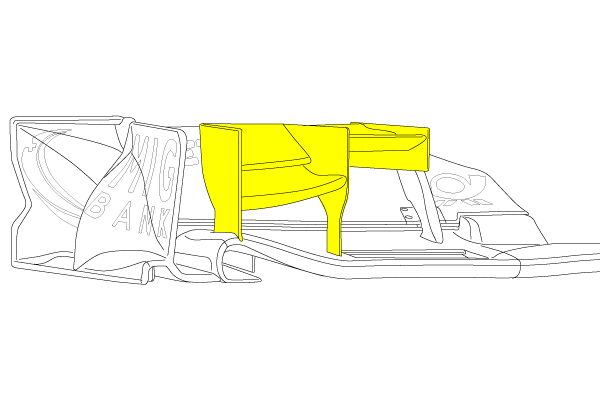 Through out 2009 and 2010 Brawn\Mercedes developed the wing, but retained the two element layout. The new wing retains all of these features to some extent. The free standing cascade has been retained, but this is now aided by a small additional winglet inboard of the main winglet. The split between the two winglets is inline with the inner face of the front tyre. This is not coincidence, as the two winglets seek to create tip vortices trailing both inside and outside the front wheel to set up the airflow structures dividing either side of the front wheel. Detail changes to the endplate include a small cut out in the trailing edge and a complex leading edge. The raised section of footplate (the horizontal outboard section of endplate) cleverly features a tiny vane inside. this vane curves outwards and was a feature of Mercedes 2010 wing. Mercedes have not gone as far as a full three element wing, across its full width. Instead they have divided the wing into three sections across its width. Near the endplate, the wings leading edge rises, this reduces the angle of attack and amount of load this area of the wing creates. 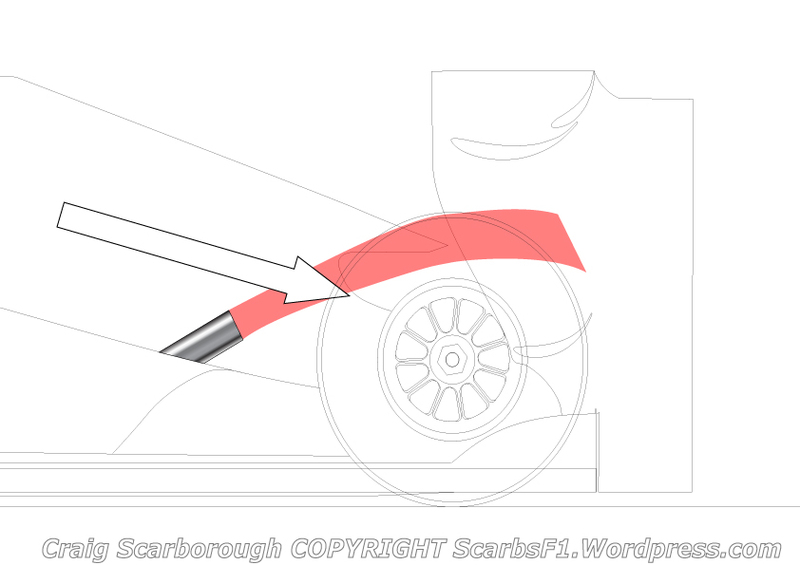 This is because the area in front of the tyre is not a good location for creating downforce, as the tyre sits directly downstream of the wing. 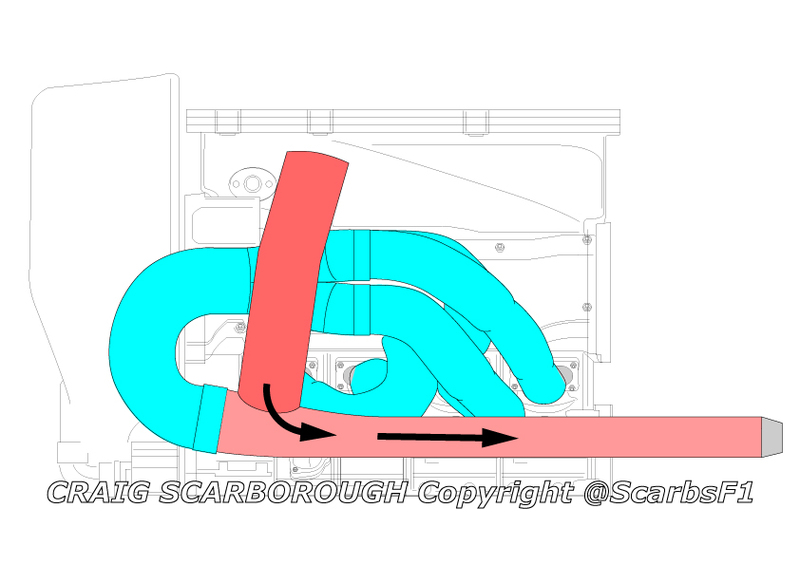 The inner span of the wing nearest the cars centreline is also much reduced in chord length and angle of attack, again downforce does not want to be created here, as the wake will upset airflow over the middle of the car. 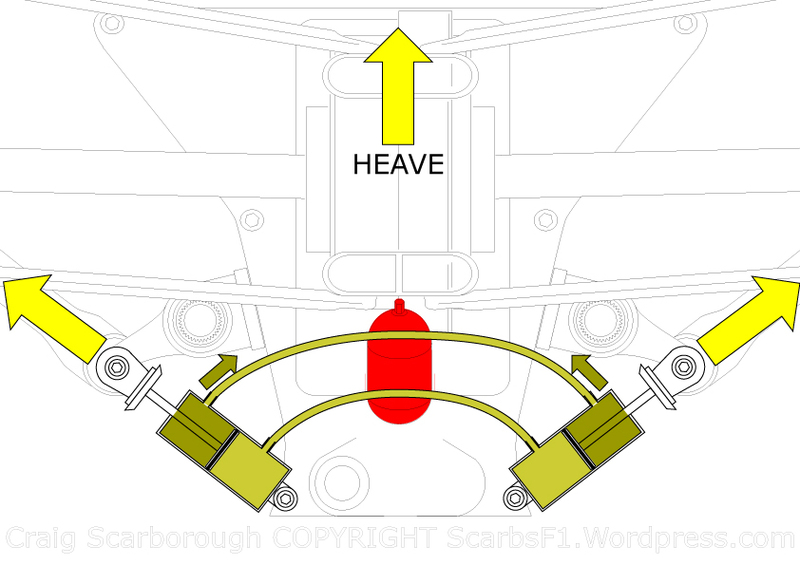 Thus the middle of the wing span, which sits both away from the tyre and the centre of the car, is the area where most load is created on the wing. We can see this section has both the greatest flap size and angle of attack. To keep the airflow attached to the wing with its more aggressive geometry, Mercedes have moulded a slot into the main plane. Higher pressure air above the wing enters the slots and helps keep the flow attached to the wings underside. This section of wing is therefore a termed a three element (two slot) wing. This creates downforce where its most efficient to do so, maximising downforce for the minimum drag and downstream disruption.